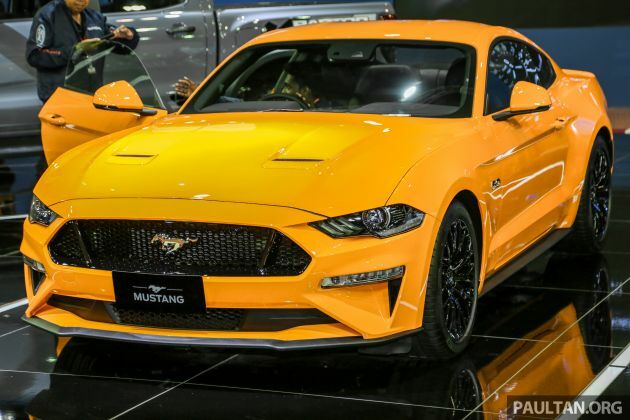 The Ford Mustang facelift has made its first appearance in Malaysia – Sime Darby Auto Connexion (SDAC) is currently displaying the refreshed sixth-generation S550 at the Kuala Lumpur International Motor Show (KLIMS), and it has been confirmed that the updated pony car will be going on sale here in 2019. As before, the Mustang will be available in both 5.0L GT and 2.3L EcoBoost fastback variant forms. We’ve previously highlighted the show car, an Orange Fury tri-coat metallic 5.0L GT fastback that has specially been flown in for the show, but a recap. The facelift features a number of exterior revisions. The front grille, bumper, bonnet and fenders have been restyled, and the car now now features all-LED front lighting as standard, with LED elements including a three-bar daytime running light array, turn signals and foglamps. As for the back, changes include a new tri-bar LED tail lamp design, new bumper, a new black diffuser and a revised exhaust tip configuration, with the EcoBoost featuring dual tips and the GT a quad layout. New to the car is a 12-inch digital LCD instrument cluster, which offers display customisation for Normal, Sport and Track modes as well as colour and gauge layout settings, as well as an 8.0 inch Sync 3 infotainment system. The 5.0 litre Coyote V8 in the GT has been updated, with improved power and torque outputs. While the North American version has 460 hp and 569 Nm (up from 435 hp and 542 Nm on the pre-facelift), the Malaysian-spec car is now confirmed as having the same 454 hp at 7,000 rpm and 556 Nm at 4,600 rpm numbers as the Australian version. As for the 2.3 litre EcoBoost, the unit makes the same amount of power as before (310 hp), but torque has been bumped up from the 434 Nm to 447 Nm (475 Nm on the US version). Both engines are paired with a Ford 10R80 10-speed automatic transmission, which replaces the previous ZF-based 6R80 SelectShift six-speed unit. Mechanical improvements include new shock absorbers that offer better ride control and a new cross-axis joint in the rear suspension to increase lateral stiffness, while new bits include a Drag Strip mode, which eliminates time lost while shifting, adding on to the Normal, Sport+, Track and Snow/Wet drive modes. The GT also gets as standard an active valve exhaust system, which allows the exhaust note to be adjusted. As detailed previously, the KLIMS 2018 show car is a 5.0L GT in its Premium level trim with elements of a GT Performance package added on. Equipment includes 19-inch Ebony Black painted wheels with 255/40 front and 275/40 rear profile tyres carried over from the pre-facelift, but the rubbers are now Michelin Pilot Sport 4S tyres (the pre-facelift GT was originally shod with Pirelli P Zeros). The Brembo six-piston front brake calipers from before also continue on. I hope this Ford got no gearbox problem and door handle jamming issues like the Ford Ranger. Caught lying again. The gearbox on the Mustang is well built and able to handle increasing boost rates in stock config. Even Shelby Mustangs maintain usage of the original Ford sourced gearboxes. Stop talking rubbish. Completely unproven and false with no evidence. The exact same 10 speed works great behind the 650 bhp zl1 camaro. Works find in the bigger far more powerful f150 raptor, works fine in the 3+ tonne Cadillac Escalade. I have to give it to you. You don’t know when to stop lying even when it’s so obvious that it borders absurdity. I advice you, get a proper job instead of lurking here and being a total fool. BTW I went there and yeah, this car was droolworthy, and the Raptor too. Request for manual gearbox then. Drools. This what makes KLIMS so much more better than other regional carshows. If you like to sleep so much, then go back to sleep. Your worthless comment is unnecessary, cause’ why Ford made the facelift regional debut in KLIMS instead of those Japan or Korea car shows? “Ford made the facelift regional debut in KLIMS instead of those Japan or Korea “, because japan and korea are not part of our SEA region. the Stang Coyote V8 5.0L GT only Rm220k in Langkawi. New Malaysia , A New Dawn greater MotorShow .Bravo MAA! Dear SDAC, if you can bring in the mustang, why not focus rs and latest fiesta st?